is to develop the insights that enable new tools and approaches to make parallel programming easier, and to demonstrate their effectiveness through prototype implementations on real problems. Exposing inter-process information for efficient PDES of spatial stochastic systems on multicores . Jonatan Lindén, Pavol Bauer, Stefan Engblom, and Bengt Jonsson. In ACM Transactions on Modeling and Computer Simulation, volume 29, number 2, pp 11:1-25, 2019. Supervised classification methods for flash X-ray single particle diffraction imaging . Jing Liu, Gijs van der Schot, and Stefan Engblom. In Optics Express, volume 27, pp 3884-3899, 2019. Efficient Memory Modeling During Simulation and Native Execution . Nikos Nikoleris. Ph.D. thesis, Digital Comprehensive Summaries of Uppsala Dissertations from the Faculty of Science and Technology nr 1756, Acta Universitatis Upsaliensis, Uppsala, 2019. 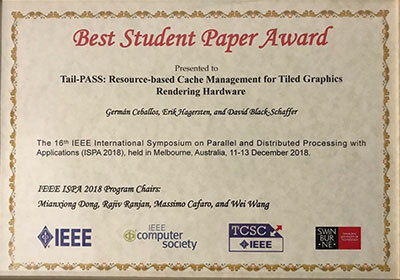 Germán Ceballos, Erik Hagersten och David Black-Schaffer received the Best Student Paper Award at the 16th International Symposium on Parallel and Distributed Processing with Applications in Melbourne, Australia. Kiko Fernandez-Reyes, Dave Clarke, Elias Castegren, and Huu-Phuc Vo have received the best paper award at COORDINATION 2018 conference for their paper "Forward to a Promising Future." Björn Victor, was awarded the Uppsala University Pedagogical Award for 2018 in the area of mathematics, natural sciences, and technology. Stefanos Kaxiras, has been inducted in the ISCA Hall of Fame . The paper Optimal Dynamic Partial Order Reduction with Observers won one of the TACAS'18 distinguished artifact awards at ETAPS 2018 in April 2018. Updated 2019-02-14 13:25:29 by Roland Grönroos.